Writer’s Note: This is my second in a series of “Things you might not know …” articles about this year’s Canadian Baseball Hall of Fame inductees. This year’s Hall of Fame induction ceremony will take place on Saturday, June 29 at 11 a.m. in St. Marys, Ont., on the museum’s ceremonial grounds. Admission is free. Born in 1959 in San Pedro De Macoris, Dominican Republic, George Bell remains the only Blue Jay to win the American League MVP Award. His monster 1987 campaign – that saw him belt a then-club record 47 homers and lead the league in RBIs (134), total bases (369) and extra-base hits (83) – is one of the best in franchise history. Plucked from the Philadelphia Phillies in the 1980 Rule 5 draft, the power-hitting outfielder was an offensive force in Toronto for parts of nine seasons. A three-time all-star and three-time Silver Slugger Award winner, Bell socked over 20 homers in six seasons and recorded more than 85 RBIs seven times with the Jays. He also smashed a major league record three home runs on Opening Day against the Kansas City Royals in 1988. The former slugger ranks in the top five in most of the Jays’ all-time offensive categories, including third in RBIs (740), total bases (2,201) and extra-base hits (471) and fourth in home runs (202). For his efforts, he was named the club’s MVP four times and was an inaugural member of the Blue Jays’ Level of Excellence in 1996. First MLB Hit: April 22, 1981. Starting in right field and batting third for the Blue Jays that day, Bell doubled off of Milwaukee Brewers left-hander Mike Caldwell at Exhibition Stadium in the fifth inning. The Blue Jays lost the game 8-1. First MLB Home Run: May 10, 1981. Hitting cleanup and starting in left field, Bell socked a two-run home run off of Boston Red Sox lefty Frank Tanana at Exhibition Stadium. The Red Sox prevailed 9-5. Best MLB Game: April 4, 1988. Though Bell had three, five-hit games (two of them with the Jays) during his career, it would be hard not to pick his record-setting, three-home run performance against Cy Young Award winner Bret Saberhagen and the Kansas City Royals as his best game. I wrote a blog entry about this game in April. Canadian Pitcher(s) He Liked to Face: Right-hander Mike Gardiner (Sarnia, Ont.). Bell was 3-for-8 with two home runs off of Gardiner. Bell was also 10-for-34 (four doubles) off of 2003 Canadian Baseball Hall of inductee Kirk McCaskill (Kapuskasing, Ont.). Pitcher He Loved to Face: Bell smashed 13 hits – including five home runs – in 30 at bats (.433 batting average) off of right-hander Scott Bankhead. Last MLB Hit & Last MLB Home Run: September 24, 1993. Suiting up for the Chicago White Sox in his final big league season, Bell’s last big league hit was a two-run homer off of Kevin Brown in the first inning of a White Sox 5-4 win at Comiskey Park in Chicago. – In the September 24, 1993 game that Bell belted his last homer in, his fellow 2013 inductee Tim Raines was also in the starting lineup for the White Sox. Raines was batting leadoff until he was removed after being hit by a pitch. In that same contest, fellow 2013 inductee Rob Ducey was playing right field for the Texas Rangers and McCaskill hurled two shutout innings in relief for the White Sox. Adding to the game’s Canadian flavour was the fact that 2004 Canadian Baseball Hall of Famer and Montreal native Jim McKean was umpiring first base. – As White Sox teammates, Bell and Raines homered in the same game twice. Read my previous blog entry for more details. – Among the National Baseball Hall of Famers that Bell homered off of during his career are: Bert Blyleven (three times), Dennis Eckersley (twice), Rollie Fingers (once) and Tom Seaver (once). wow, Kevin…where do you find this information! What great facts. Reading this brings back a lot of memories about Bell and the Jays. 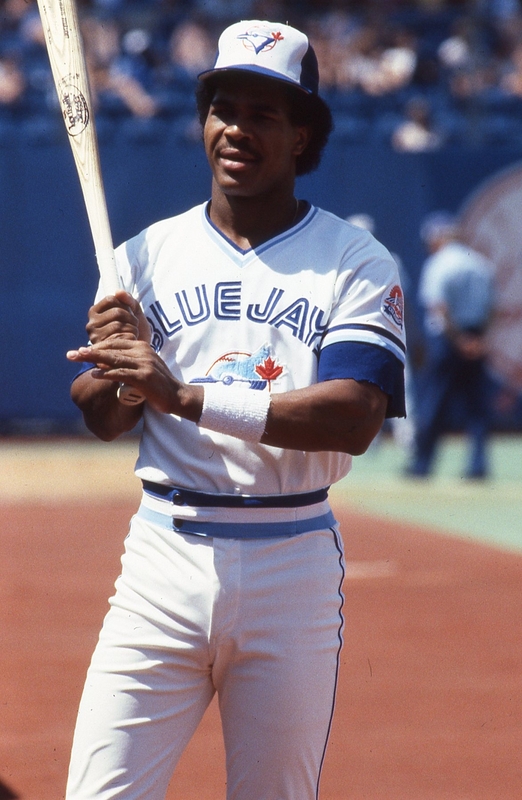 I loved Bell as a player – although during his hey days with the Jays I was in elementary school. Old enough to remember watching him play when the CBC showed Jays games. I wish I could track down some George Bell highlights. Was a highlight reel shown as part of the induction ceremony for the players inducted this year? Thanks for the comment, Tim. There was no highlight reel at the induction, but sometimes the Hall sells a DVD of the entire ceremony. I’m not sure if they have one for this year’s ceremony, but it might be worth checking out. Thanks again. Maybe we can petition them to put up more? You can even find a George Bell brawl on the same channel! Fabulous stuff, Tim. Thank you very much for posting these!